Goldendoodles is one of the most popular breeds in the world of pets because of their irresistible cuteness. They are known to be the lovable and very energetic curly dogs. However, taking care of their elegant curls is not an easy task. It requires careful routine grooming including brushing and bathing. In order to prevent their curls from developing mats, owners will need extra help from detanglers. What are Detanglers and How to Use Them? Goldendoodles have soft and fluffy curls. That is why it is important to maintain their looks by proper care in order to prevent such risks. Mats can develop on your pet’s dead or loose hair as they become tangled. Through regular brushing, loose hair and forming mats can be removed. If not, they might turn into big tangled mats that need to be clipped by pet groomers which are not usually advisable for your pets. To help you with the fur mats, owners may use a detangling spray or known as detanglers. This product helps condition the hair of your dogs and avoid the formation of tangled hairs. Detangling sprays can remove the dirt on the dog’s coat. One of the most effective ways to use detanglers is to spray them on your Goldendoodles after their bath. The use of detangling spray does not necessarily remove the mats but help avoid development or formation of such. If you want to use detanglers on your dogs, it is important to keep an eye on good quality products to ensure appropriate use. When you want to buy detanglers for your pet, it is very important to consider several factors before selecting the right product. For example, it is important to select a product that will work well with curly hairs. The All-New Natural Apple Detangling Spray is one of the best products in the market today. It is able to penetrate developed tangles and mats and makes the coat soft, manageable, and beautiful. It is an all-natural pet spray that holds tough mats. Made from natural ingredients such as Jojoba Oil, Aloe Vera, and Mineral oil, this detangling pet spray guarantees safe use for pets. Its botanical composition increases the Goldendoodle’s coat strength, soothes dry skin, and help promote healthy growth of coat. The All Natural Apple Detangling Spray is proudly made of hypoallergenic formula which is best for Goldendoodle’s sensitive skin. It has no detergent or alcohol content, making it safe for puppies as well. It does not contain any harmful ingredients or chemicals which is perfect for pets that do have allergies and other sensitivities. This product is guaranteed high quality. It is also used for other pets such as cats, kittens, rabbits, or Guinea pigs. This product comes in a wonderful aroma scent that makes the coat fresh and soft. It does not leave any residue like other cheap detangling sprays. Aside from that, the product is also user-friendly which means the owner’s hands will smell good and feel soft every after use. This product boasts its ethical commitment by using socially responsible activities such as using locally made and sustainable ingredients without the use of animal cruelty in making the product itself. 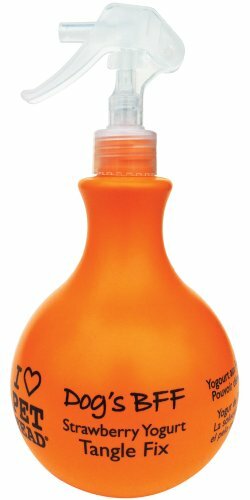 The BioSilk Therapy Detangling Mist is one of the best detanglers for dogs. It has natural ingredients that minimize the stress of dogs when used because it does not require maximum effort when pulling matted areas on Goldendoodles. It can make the dog’s fur soft, shiny, and smell fresh. This product can be sued for all kinds of dogs and puppies. The BioSuilk Therapy Plus Shine Mist for dogs offers the same natural ingredients and one of a kind technology same as the BioSilk Therapy for humans. It comes in the sophisticated formula with vitamins and silk that is able to restore the softness and moisture of your dog’s coat. This product is best used in between baths. It can loosen and detangle knots and mats on your pet’s coat yet still leaving a shiny finish after a bath. Some of its ingredients include soy protein, papaya leaf extract, silk protein, Jojoba oil, panthenol, and Aloe Vera. 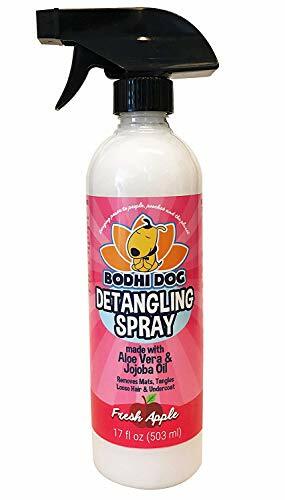 The Pet Head Fur Ball Detangling Spray is a strawberry yogurt scented spray that works well in getting rid of tangles easily in your dog’s coat. It is an eco-friendly product made of natural ingredients and well-balanced pH formulation that makes it safe for licking or swallowing. It is suitable for all types of dogs including Goldendoodles. This product is guaranteed high quality as it is made of fine ingredients such as sunflower seed oil, vitamin E, and wheat protein that can effectively remove tangled hair on the dog’s coat. If your pet has curly or long coats, then the Pet Head Fur Ball Detangling Spray is the perfect choice for you. For pets with long and curly fur, it is important for pet owners to keep their Goldendoodle’s coat healthy and soft. Dog breeds with heavy coats usually have the tendencies to have matted or knotted tangles. Read our post about the best dog clippers for matted hair. This is why the importance of detanglers or detangling sprays must be considered. Detanglers help loosen the tangles and remove knotted furs and keep the dog’s coat silky.